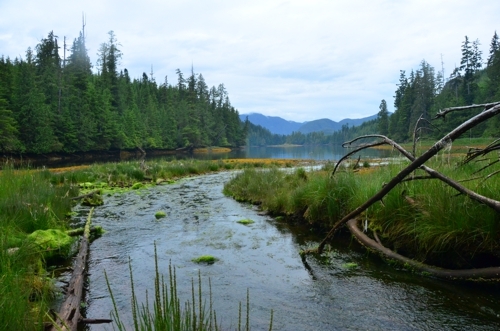 Hankin Cove is one of a few good anchorages in Kyuquot Sound. The distance from Walters Cove is less than 10 nm, so it doesn’t take long to reach. Inside, the cove has plenty of room for anchoring and lots of coastline to explore. I arrived in strong winds and heavy rain. After dropping the anchor, I hung out inside until after dinner, when the weather cleared and the sun peeked out. I hopped in the kayak and set of exploring. 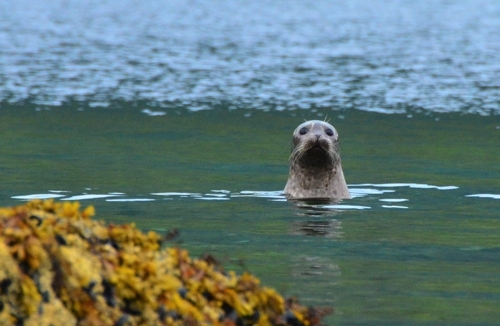 A seal colony on the Expedition Islets had attracted my attention when I entered the cove, so I paddled towards it. Unfortunately these seals were exceptionally skittish, and scampered into the water soon after they spotted me, still 1000 feet away. I felt badly forcing them off their rock. I turned around and headed back inside Hankin Cove, paddling around the perimeter. Several seals followed me, gradually getting closer. They must have been curious. No other cruising boats. Come to think of it, I haven’t seen another cruising boat in Kyuquot Sound. Where are they all?